performing or breeding programs and live alone, sometimes in small enclosures. at least three times in his lifetime. Musth is a periodic condition in bull elephants, characterized by highly aggressive behavior, accompanied by a large rise in reproductive hormones. Testosterone levels in an elephant in musth can be as much as 60 times greater than in the same elephant at other times. Asian elephant males have usually started their musth cycle by the time they are 20. African bulls do not reach this stage of maturity until later, typically closer to 25 years of age. A musth elephant is primed to mate, and fights other bull elephants, attacks other animals, and may destroy inanimate objects in its way. A musth elephant in captivity is extremely dangerous to its human keepers. Musth bulls produce a distinctive low-frequency vocalization, the musth rumble, and have thick secretions from their temporal glands (the duct from the temporal gland opens between the eye and the ear). As a control measure for bull elephants in musth, in some countries, they are deprived of food and water. In India, for example, they are tied between two trees, placed on a starvation diet and given limited water. Most captive bulls spend their lives alone. . . living in concrete bunkers or chained in tiny spaces. 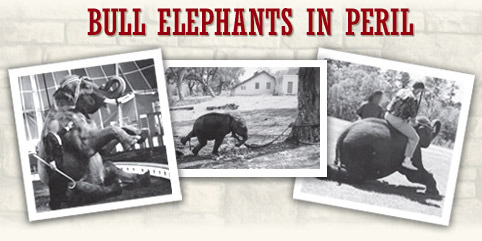 PAWS' ARK 2000 is the only sanctuary in the U.S. offering refuge for captive bull elephants. Caring for elephants, in general, is extremely expensive, but bull elephants, because of their size and strength, require stronger, more costly barns, stalls and fencing. PAWS' bull elephant fencing costs $168 per linear foot. When PAWS agreed to take Nicholas, a 13-year-old Asian bull elephant, nobody else wanted him. Nicholas currently enjoys a large natural habitat with a pond, trees and grassy hills. We have constructed an additional 8,000 square foot barn to house future rescued bulls. We are working to complete the fencing on a second bull elephant habitat. We need your help to accomplish this. Please consider donating to our Foot-of-Freedom campaign.